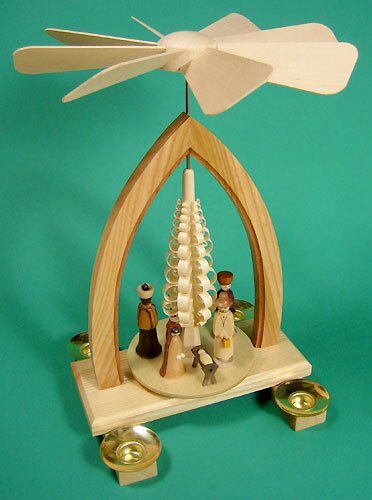 This Christmas Nativity German Pyramid is a fine mixture of woods to display the Nativity Figurines which spin around the shaved wooden tree. Made in Seiffen Germany this Christmas Nativity Carousel Pyramid uses 4 medium. candles to spin the carousel and stands about 9 1/2 inches tall. German Pyramids are great holiday decorations that will delight your guests and family.